The Endangered Archives Blog features janani, a book written in praise of mothers. 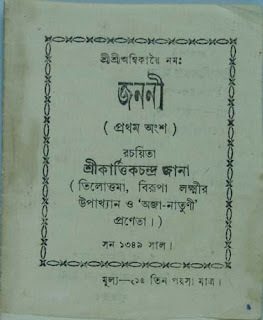 Written and published by karttikchandra jana in 1942, the book is an excellent example of the material from the project to archive 'popular market' Bengali books. The mission of the Endangered Archives Programme is "to contribute to the preservation of archival material that is in danger of destruction, neglect or physical deterioration world-wide”.